Aberdeen manager Derek McInnes insists defeat is not an option for his side away to Hearts on Friday if they want to maintain their title challenge. The Dons trail Premiership leaders Celtic by four points having played a game more and McInnes knows his men can ill-afford any slip-ups. "We're going there to try to win because we know we don't have a lot of room for error, "McInnes said. "We want to keep ourselves in the fight as much as possible." McInnes is hopeful Friday night's match at Tynecastle will go ahead after the Edinburgh side's scheduled game on Tuesday against Inverness Caledonian Thistle was postponed due to an outbreak of illness in Robbie Neilson's squad. Up to 12 Hearts players have been suffering from gastroenteritis, but there is no suggestion that Friday's match is under threat. "I'm encouraged by what's coming out of Hearts when they said yesterday that they're confident that the game will go ahead on Friday," the Aberdeen manager said. "Our preparation's the same. We're looking forward to the game. It's a very important game, as every game is at the minute. "We know there's no real margin for error at this stage of the season to keep close to Celtic." Aberdeen have visited Tynecastle twice this season, with mixed results. Hearts knocked the Dons out of the Scottish Cup at the fourth round stage with a 1-0 victory in January. 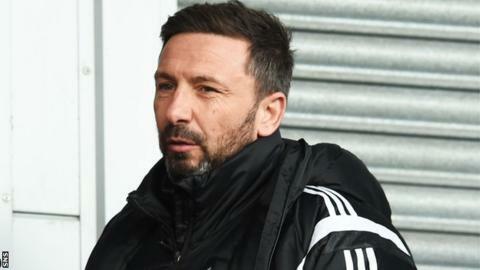 McInnes has fonder memories of the 3-1 league win his side registered in Gorgie in September that extended Aberdeen's Premiership winning streak to eight matches. "We were strong that day," he said. "We got ourselves in front and were quite clinical with our work in that first-half. "We thought Hearts would be a strong side this season with the squad they've managed to put together. "They've shown that and I think they deserve huge credit for the way they've performed this season. Very confident side, good experience in the right areas. "We've got a tough job. But, if we get that level of performance again, it gives us a chance to go and win the game. "We didn't set out this season to finish second. Last season, we were 20-odd points ahead of third spot and Hearts have certainly made sure that we are having to keep concentrating on that side of it. "Hearts will qualify for Europe, as we have done, and they'll be trying to pull back us towards them as we're trying to pull Celtic back towards us. "There's still plenty to play for. The three points are equally as important for both teams."